Anomalous origin of the left circumflex (Cx) coronary artery from the right sinus of Valsalva is a well-known coronary anomaly which is thought to be of no clinical significance per se. However, the recognition and adequate visualization of the anomaly is essential for proper patient management. 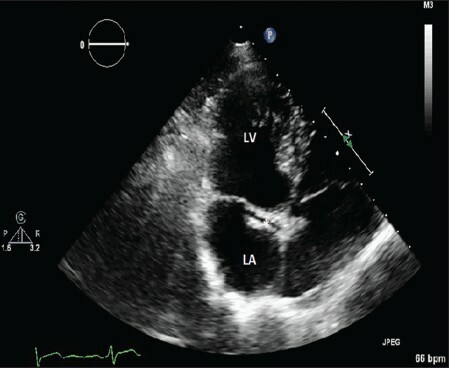 We present here a case with this anomaly in whom the diagnosis was made by transesophageal three-dimensional (3D) echocardiography and coronary computed tomography angiography (CTA). A 53-year-old man presented to our clinic with a three-week history of palpitation. Hypertension and other risk factors of coronary artery disease were not present. Physical examination revealed a heart rate 75 beats/min and a blood pressure of 116/70 mmHg. Heart sounds were normal and there was a 2/6 systolic ejection murmur at the apex. Laboratory results showed no abnormality. Electrocardiography showed normal sinus rhythm, and incomplete right bundle branch block with no ST-T changes. An echocardiogram revealed normal chamber size and left ventricular wall motion with mild to moderate mitral insufficiency. A tunnel shaped structure extending beneath the anterior mitral leaflet in the atrioventricular groove was also noticed [Figure 1]. However, the origin and anatomical properties of this abnormal image could not be sufficiently clarified in two-dimensional (2D) transthoracic echocardiography. Therefore, TEE was performed. 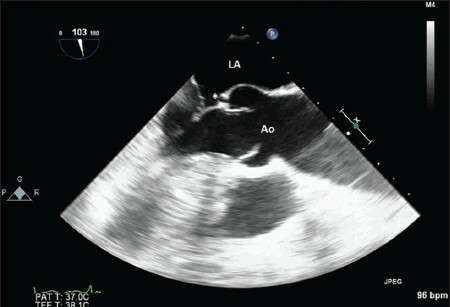 Midesophageal long-axis TEE images gave the appearance of a communication between the non-coronary sinus of Valsalva and the left atrium (LA) [Figure 2]. However, flow between the chambers could not be demonstrated with color Doppler. In order to demonstrate anatomical properties of this structure 3D TEE was performed. 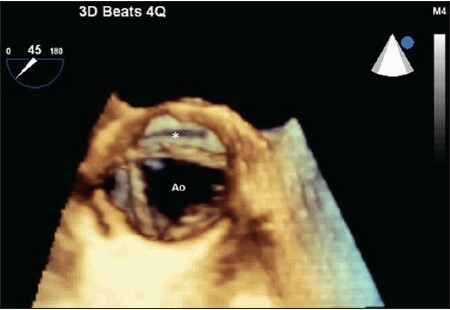 On 3D TEE examination, raised the suspicion of anomalous Cx artery. Although its origin could not be identified, its path could be followed through behind the aortic root to its usual location in the atrioventricular groove [Figure 3]. CTA was subsequently performed which showed aberrant Cx origin from the right aortic sinus of Valsalva with a further retroaortic course of Cx within the atrioventricular groove [Figure 4]. The Cx was originating as a slit like ostia with acute angulation from the right sinus. Myocardial perfusion scintigraphy (MPS) revealed mild ischemia in the inferolateral wall. Holter electrocardiogram showed no arrhythmias. Our patient did not receive further diagnostic or therapeutic options, so we recommended medical therapy with optimal treatment of his cardiovascular risk factors. Although this anomaly is usually benign and asymptomatic, it was reported that, it may cause ischemia, sudden death, and myocardial infarction. ,, These manifestations may be the result from repeated compression of the anomalous artery by a dilated aortic root or to slit-like ostia or to unusual angling as a result of the retroaortic course of the Cx. In our patient, Cx was originating as a slit-like ostia with acute angulation and myocardial perfusion scan (MPS) revealed mild ischemia in the inferolateral wall. Failure to recognize the anomaly can be hazardous to patient management. In our case, the initial echocardiographic images gave the appearance of a sinus of Valsalva to LA fistula or a coronary artery fistula. This might be the result of the tangential course of the anomalous Cx as it passed posteriorly the aortic root. This finding was evaluated in detail with 3D TEE to avoid misinterpretation. The diagnosis of coronary artery anomalies is usually made by angiography. However, it is difficult to define the course of these vessels by this test. TEE and CTA are good semi-invasive and noninvasive tests to evaluate for these anomalies. Recently 2D and 3D TEE has been shown to be of value in identifying the anomalous origin of the Cx from the right sinus of Valsalva. , In our case, we suspected a coronary anomaly from transesophageal echocardiographic views. In order to demonstrate anatomical properties, 3D TEE was performed. The anomalous Cx coronary artery was noticed by 3D imaging as a vessel running around the posterior aortic wall. Color Doppler flow confirmed the course of an anomalous Cx coronary artery. CTA was subsequently performed which showed aberrant Cx origin from the right aortic sinus of Valsalva with a further retroaortic course. The present case is a rare one in which the anatomical relation between the anomalous coronary artery and aorta was detectable by transesophageal 3D echocardiography. 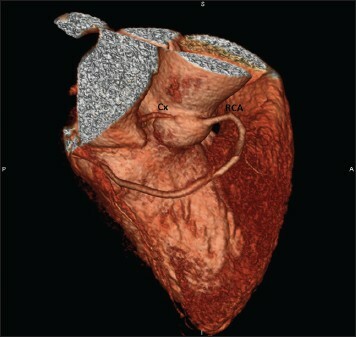 Transesophageal 3D echocardiography and CTA are useful for the assessment of this type of coronary anomaly. 1. Tanzola RC, Allard R. Transesophageal echocardiography of an anomalous circumflex coronary artery: Anatomy and implications. Anesth Analg 2009;109:1029-31. 2. Antopol W, Kugel MA. Anomalous origin of the left circumflex artery. Am Heart J 1933;8:802-6. 3. Page HL Jr, Engel HJ, Campbell WB, Thomas CS Jr. Anomalous origin of the left circumflex coronary artery. Recognition, antiographic demonstration and clinical significance. Circulation 1974;50:768-73. 4. Corrado D, Penelli T, Piovesana P, Thiene G. Anomalous origin of the left circumflex coronary artery from the right aortic sinus of Valsalva and sudden death. Cardiovasc Pathol 1994;3:269-71. 5. Carboni GP, Sedati P. A rare, life-threatening effort angina and anomalous origin of the left circumflex coronary artery: CT and SPECT findings. BMJ Case Rep 2013;2013:1-2. 6. West NE, McKenna CJ, Ormerod O, Forfar JC, Banning AP, Channon KM. Percutaneous coronary intervention with stent deployment in anomalously-arising left circumflex coronary arteries. Catheter Cardiovasc Interv 2006;68:882-90. 7. Aydin M, Ozeren A, Peksoy I, Cabuk M, Bilge M, Dursun A, et al. Myocardial Ischemia caused by a coronary anomaly: Left circumflex coronary artery arising from right sinus of Valsalva. Tex Heart Inst J 2004;31:273-5. 8. Veinot JP, Acharya VC, Bedard P. Compression of anomalous circumflex coronary artery by a prosthetic valve ring. Ann Thorac Surg 1998;66:2093-4. 9. Liberthson RR, Dinsmore RE, Fallon JT. Aberrant coronary artery origin from the aorta. Report of 18 patients, review of literature and delineation of natural history and management. Circulation 1979;59:748-54. 10. Nanda NC, Bhambore MM, Jindal A, Misra VK, Ansingkar K, Puri V, et al. Transesophageal three-dimensional echocardiographic assessment of anomalous coronary arteries. Echocardiography 2000;17:53-60.